Last weekend Rob and I went to see our grand daughter, Madelyn. It was her second birthday. I can’t believe how quickly time went and that she is already two! If you ask her how old she is she will tell you “two weeks”. I’m not sure where she got that from, but it is adorable. She is also a genius! I mean it. She is so bright. Ok, I will admit I am her grandmother so I may be just a wee bit biased but how many two years olds can sing the alphabet song? She sung it perfectly except for the usual jumble of l, m, n, o p. See? I told you she is a genius! For her birthday party she dressed like Minnie Mouse. 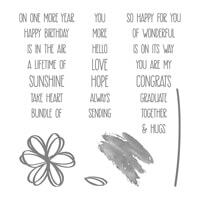 I made this card using the stamp set Sunshine Sayings. This set has matching Thinlits called Sunshine Wishes. Both of these items are being carried over into the new Annual Catalog which starts June 1st (Yay!). This entry was posted in Madelyn, Sunshine Sayings, Sunshine Wishes and tagged Sackets Harbor Stampin Up, Stampin Up Fort Drum, stampin up new york, stampin up ny, Stampin up Sackets Harbor, Stampin Up Watertown, Stampin Up Watertown NY, Sunshine Sayings, Sunshine Wishes, Susan Horr, Watertown ny stampin up, Watertown stamping up. Bookmark the permalink. 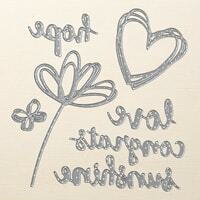 ← New To Stamping? Where To Start? What a cutie! And, yes, she is brilliant! Pretty card, too. I love the soft colors. Madelyn is just wayyyyyy too cute! I like the delicate simplicity of the card!